OK, I tried to make this salsa look attractive and exciting, but hey let’s face it, it’s salsa. It may not look enticing, but it tastes great. I’m posting this salsa recipe in celebration of Cinco de Mayo, (which is this Saturday in case you forgot). Are you celebrating Cinco de Mayo? We’re not exactly celebrating it, but we’re definitely going to consume some Mexican fare and have ourselves a margarita or two. This is the perfect salsa to bring to a party or to serve up at home with your favorite chips and Mexican fare. It’s got a bit of a kick to it, but not too much where your kids won’t enjoy it. Eli kept dipping his chips in it, so I know it wasn’t too spicy for him. 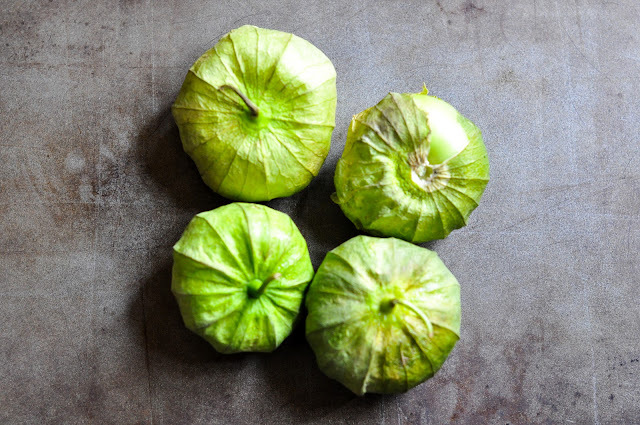 These are tomatillos in case you were not sure what they looked like. 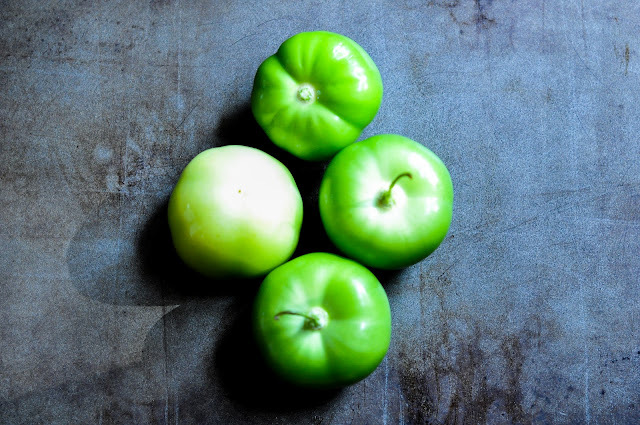 They don’t look so pretty on the outside, but take away their outer skin and underneath you will find a bright green beauty. Remove the husk from the tomatillos and wash off the sticky film. They are sticky little suckers until you rinse them. 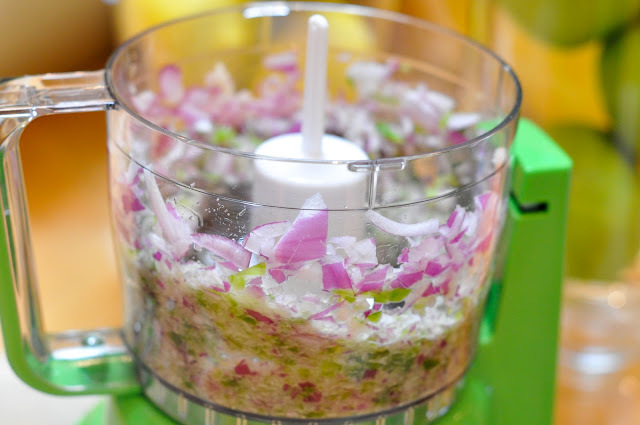 Put the onion, jalapeno, and garlic in a food processor and finely chop. 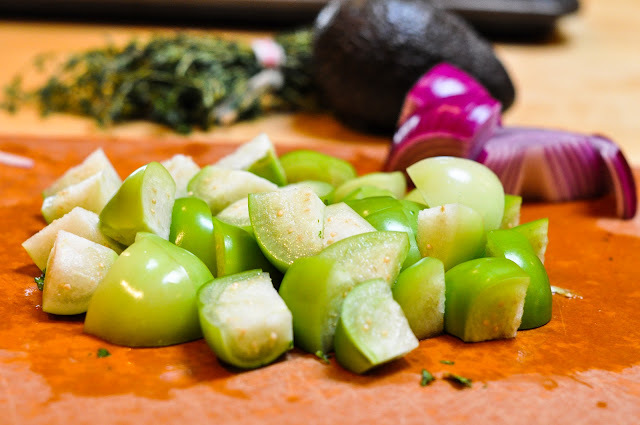 Add the tomatillos, avocado, and salt and pulse until chopped but still chunky. 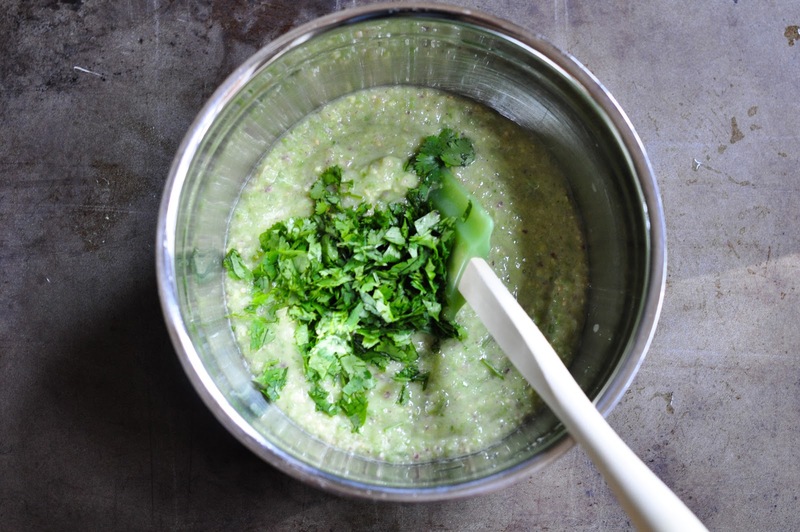 Transfer to a bowl and stir in the cilantro. That’s all there is to it. Pretty easy! Grab some chips and dig in! I just stumbled on your blog via pinterest and I’m so glad I did!! You have some amazing recipes. Hi Val! Thanks for stopping by. Pinterest is an amazing thing. If you try something let me know as I love to hear feedback! I am soooo going to try this one for my next neighborhood party!!! Hi Amanda! I feel like I haven’t seen you in ages. Great to hear from you. I actually thought of you as I posted this recipe as I knew you would be celebrating Cinco de Mayo with the neighborhood. Have a great celebration girl! 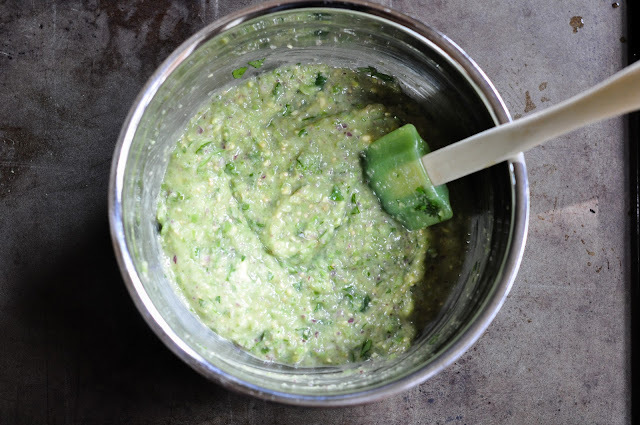 I don’t like avocado at all, but the salsa is so pretty in your photos that I want to have an itty-bitty taste. And the tacos! 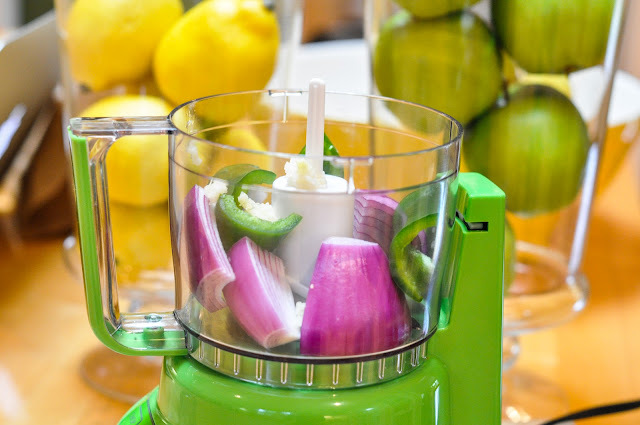 I wanted them the first time around: it’s going to be a delicious Cinco de Mayo at your house. Wow Sharyn. You are the first person I have met that does not like avocado. I adore it and eat it all the time, thank goodness that it’s a healthy fat. I actually think we may try a new taco for Cinco de Mayo! I’ve been wanting to make fish or salmon tacos for some time. I think it looks really good – the color is very pretty! 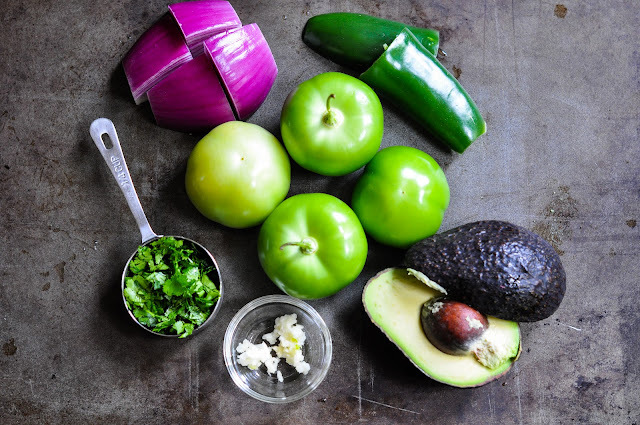 I bet the tomatillos give this salsa such a nice tangy flavor and the avocado makes it creamy… YUM! Thanks Pam! 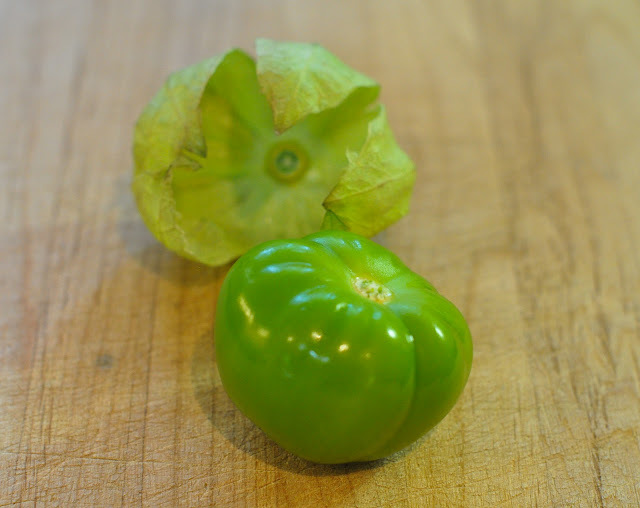 The tomatillos added a unique flavor and this salsa reminded me more of guac that actual salsa. That photo DOES look so appetizing.. and I bet this tastes delicious. I saw your reply about making the tacos first because of the flavour and so I’ve got that lined up for Saturday lunch! We are seriously missing our slow cooker and it looks like a great way to get that yummy flavourful shredded chicken, without actually having one. Very excited! Thanks Em! It was actually Zoe that said, “mom, it’s salsa, you really can’t make it look any prettier.” Love her! So glad you’re trying the tacos. I am assuming you mean the chicken ones, right? You can borrow our slow cooker anytime as I never use it!